MetroPCS outdoor advertising and inflatable advertising products created for franchise owned stores. 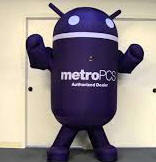 Do you have a Metro PCS store grand opening or is your store throwing a promotion that you want to draw attention to? Let the pros at Star Advertising help bring you the neccessary attention and customers that you need to succeed. Shop the full Metro PCS collection of inflatable 6ft Air Dancers®, 10ft Air Dancers®, 20ft Air Dancers®, 15ft Feather Flags, 7ft Feather Flags, Pop Up Canopy Tents, A Frame Signs, and Table Top Cover Banners. Get your Metro PCS store noticed today! Includes Blower and Hardware.